In Apple's Safari web browser, there are several ways to make viewing web pages easier on the eyes. All of them involve adjusting the font size or the zoom level that Safari applies when it loads web page content, which can be helpful if you're using a small screen or a large display set at a high resolution. To increase or decrease the zoom level of both text and images when viewing web pages in Safari, press Command and the + (plus) or - (minus) keys. You can also click on View in Safari's menu bar and select Zoom In or Zoom Out. Alternatively, you can add zoom buttons to Safari's interface: Right-click (or Ctrl-click) on a space in the Safari toolbar and click Customize Toolbar.... Then drag the Zoom buttons in the dropdown to the space you just clicked on the toolbar. Click Done to finish. If you want to keep images at the same size and only adjust web page font size on the fly, press Option-Command and the + or - keys. 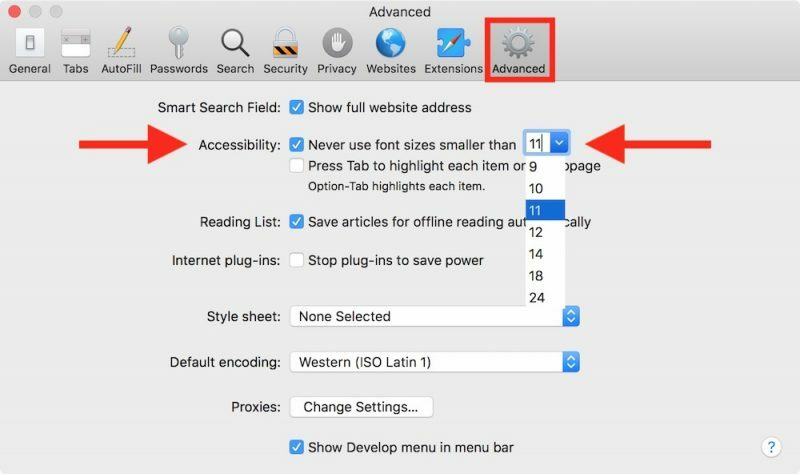 You can also hold down the Option key and click on View in the Safari menu bar, which changes the Zoom options to Make Text Bigger and Make Text Smaller. 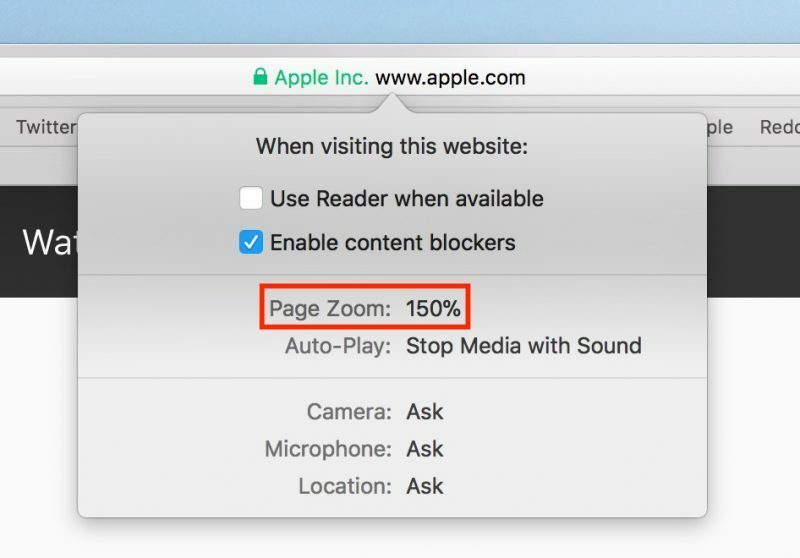 Safari will remember your zoom and font size settings until you clear your History. To do so, click Safari in the menu bar, select Clear History..., then click the Clear History button. 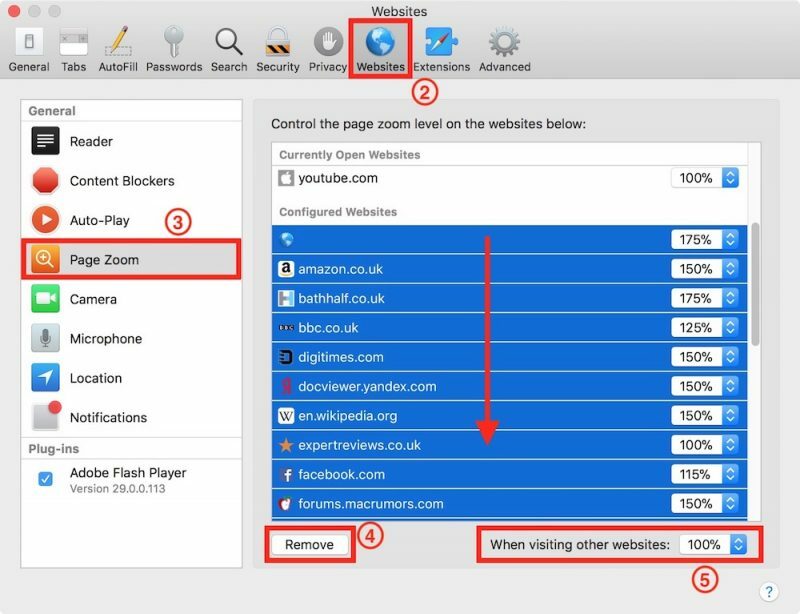 Once the zoom level is set up for a particular site, Safari applies it automatically whenever you visit it. Here's how it's done. Navigate to the site that you want to adjust the zoom level for. Right-click on the URL or website name that appears in the address bar, and select Settings for This Website. Alternatively, click Safari in the menu bar and you'll see the same option just below Preferences. Click Page Zoom in the General column. Clear any Configured Websites in the list by highlighting them all with your mouse button and then selecting Remove. Click the When visiting other websites pop-up menu and choose a percentage to suit. If none of Safari's zoom level increments sit right with your eyes, here's a way to set your own percentage. In TextEdit's menu bar, select Format -> Make Plain Text. Name the file safari zoom.css or whatever you like, just make sure it retains a .css suffix. Choose a location for the file and click Save. Back in Safari, select Safari -> Preferences... in the menu bar. Navigate to the location of your saved CSS file, select it, and click Choose. 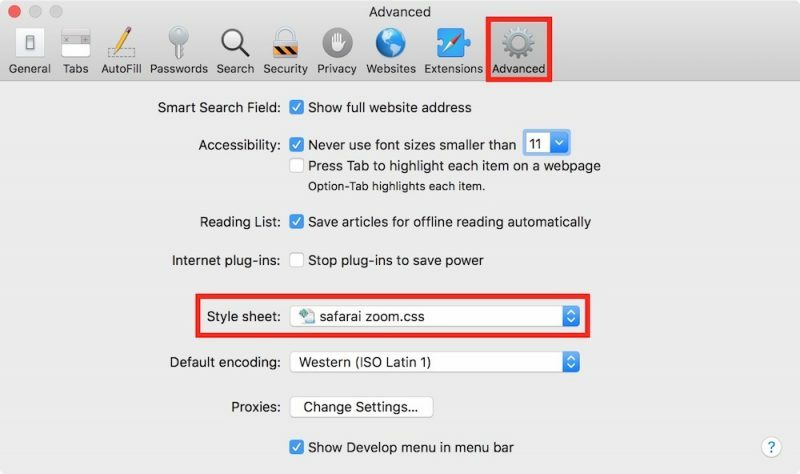 From now on, Safari will default to the zoom level specified in your style sheet file, which you can edit at any time. 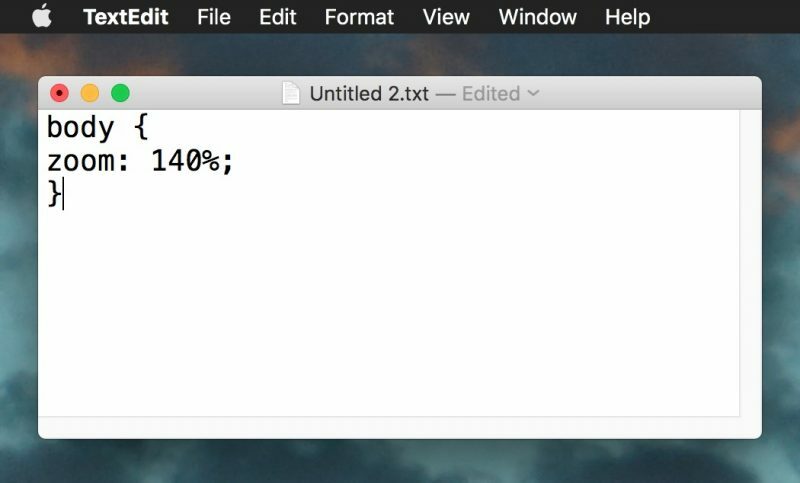 Finally, there's an option in Safari that lets you force websites to display text using a minimum font size, without affecting the zoom level. In the Accessibility section, check the box next to Never use font sizes smaller than: and select a font size in the dropdown. [USER=3]@MacRumors[/USER] : There's also the feature (originally from Safari on iOS?) where you can two-finger double-tap on a column of text and Safari will zoom in on that column. I use that All. The. Time. It gets the part I want to look at right then, it's crazy easy to do, and you can switch back with the same gesture. I also use the Cmd-Opt-+ sometimes, with Cmd-0 to reset to normal size (regardless of how many '+' or '-' you've done).